Micro CHP Market size will surpass USD 13 Billion by 2024, as reported in the latest study by Global Market Insights, Inc. Positive outlook toward changing climatic conditions, energy security along with government regulations to curb GHG emission will propel the micro combined heat and power market size. Growing deployment of sustainable energy technologies coupled with introduction of various mandates and norms toward green building codes will propel the business landscape. The U.S. EPA in 2018 introduced the International Green Construction Code to enhance the health and environment performance of building, structures and sites. Increasing demand for reliable, energy efficient and cost-effective systems for heat and electricity generation across residential and commercial buildings will stimulate the micro CHP market share. Volatile fossil fuel prices coupled with growing focus to reduce fossil fuel dependency are some of parameters enhancing the demand for energy efficient systems. Zero interest rate loan, tax rebate, and financial assistance are few incentives introduced by the regulators to promote the adoption of these systems which in turn will complement the business growth. The U.S. micro CHP market in 2017 was valued USD 700 thousand. Increasing demand for efficient and sustainable space heating and cooling solutions on account of accelerating investments toward the development of infrastructure sector will propel the product penetration. Favorable government measures to enhance the deployment of green technologies along with strict government norms pertaining to carbon emissions will further augment the industry dynamics. >2 ≤ 10kW micro CHP market size is predicted to witness growth owing to emerging demand for continuous and reliable power supply from residential and commercial establishments. Demographic change, rising disposable income of individuals, strengthening purchasing power parity and improved living standards are some of key factors positively influencing the demand for electricity generation. Residential micro CHP market is set to grow on account of increasing demand for retrofit and replacement of conventional boilers along with ongoing investment toward refurbishment and innovation across new establishments. Growing focus to save electricity bills along with shift in trend to improve living standards will further augment the industry landscape. 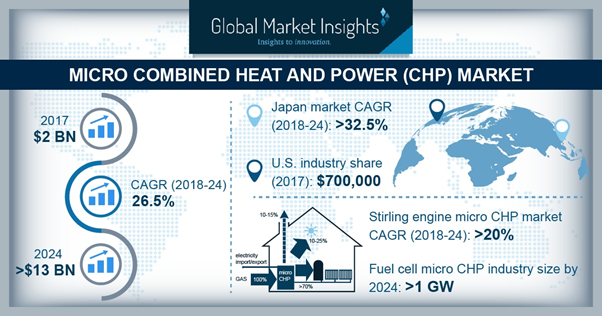 Fuel cell micro CHP market is anticipated to reach over 1 GW by 2024 Ability to minimize carbon dioxide emissions and reduce energy cost in residential sector are certain indispensable parameters driving the product demand. High electrical efficiency and low heat to power ratio are some of the features make its adoption preferable over others. Several programs including PACE have been introduced to promote the adoption of fuel cell across residential establishments. Limited land availability for incinerators and landfills coupled with growing awareness toward waste management will augment the renewable resource micro combined heat and power product adoption. Favourable government incentives and initiatives to enhance the utilization of biomass will further propel the industry growth. Key participants across micro combined heat and power market include. Yanmar, BDR Thermea, 2G Energy, VIESSMANN, General Electric, Siemens, Veolia, Vaillant, Marathon Engine System, Micro Turbine Technology, Ballard Power System, ENER-G Rudox, AISIN SEIKI, TEDOM, Samad Power.